As a psychologist in a prison hospital, Eva Ross had always dealt with her share of sinners. The corrupt, the insane, their minds were all hers to unlock. But when those around her, those she trusted with her life start to exhibit the same characteristics, she is forced to turn to a stranger, a man whose name she is incapable of even remembering, for sanctuary. Follow Eva as she crosses continents to unlock the answers, and her eventual destiny. 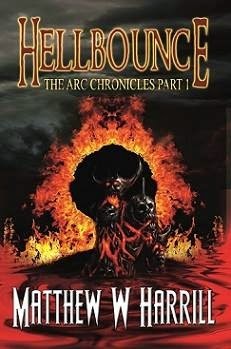 Hellbounce. PS: I am currently reading this book and I love it! Look for my review soon. "Eva woke to the sound of the television churning out early morning commercials. She sighed. “Another morning, another hotel.” It seemed to her that since Worcester, she had lost all sense of identity. Not all of that had been because of the anonymity that radiated from Madden, but it had had an effect. With the revelations in her life, she had had no choice. Throwing on some clothes, Eva opened the curtain and delighted in what Madden had promised would be a spectacular view. The Chattanooga National Park, dominated by the majestic Lookout Mountain lay in front of her. Forests at the base led to scrub and tree-laden slopes, with the grey behemoth dominating the middle. Even from this far away, it made Eva feel insignificant. It was not the first time in the past few days she had felt that way. Since waking up in the shadow of Mount Rogers a few days ago, their travel had been bordered by mountains the whole way. Even when Madden had insisted they detour to stop at an old friend’s house in Knoxville, it turned out to be the grandest of mansions. Then the friend had insisted that despite Eva’s urgency, they take a trip into the Smoky Mountains. She could not avoid feeling small and out of control."